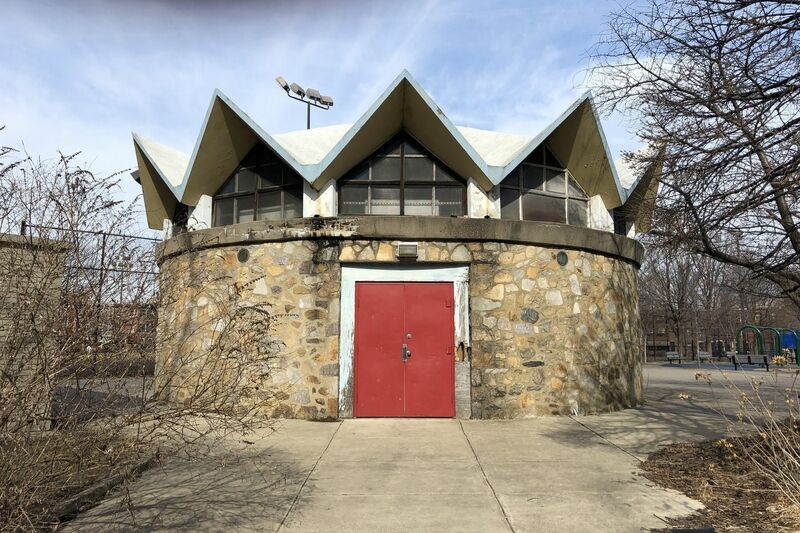 Designed in 1960 by Elizabeth Fleisher, this unusual round building in Columbus Square is a South Philadelphia landmark. The Department of Parks & Recreation plans to tear it down as part of a park renovation. Something must have been in the water that architects were drinking in the late 1950s. After years of dutifully turning out functionalist, right-angled slabs, they began to play with curves. By the early ‘60s, round buildings were popping up around the country. Philadelphia embraced the new circular forms with open arms, building round banks, round apartment houses, and round park pavilions. In 1960, the city opened two cylindrical park follies, one in LOVE Park, the other in Columbus Square. Initially admired, then rejected, and now admired again, the two pavilions are experiencing opposite fates: The Center City building, affectionately dubbed the “flying saucer,” is undergoing a $3 million restoration and will re-open this spring as a restaurant. Its South Philadelphia cousin is slated for demolition as part of the planned renovation of Columbus Square. What's with all the round buildings in Philadelphia? The loss of this charming pavilion would be a double blow for Philadelphia history. Not only is Columbus Square’s little stone tower a fine example of mid-century modern design, it is also one of a handful of surviving buildings by Elizabeth Hirsh Fleisher, the first woman in Philadelphia to receive a license to practice architecture. Fleisher, who partnered with Gabriel Roth to form Roth & Fleisher, is best known for her work on Parkway House, a luxury apartment house that features gently curved bay windows. Originally known as the Welcome Center, the round building in LOVE Park opened in 1960, the same year as Elizabeth Fleisher's Columbus Square pavilion. Like many round buildings, Fleisher’s Columbus Square pavilion occupies an important junction in the city. It sits at the corner of 12th and Reed, where the city’s disciplined grid breaks down into a series of diagonal tributaries that flow toward Passyunk Avenue. Its rustic stone walls give it the presence of a medieval fortress and make it a neighborhood gateway. Although the pavilion opened the same year as the LOVE Park saucer (designed by architect Roy Larson and engineer Nicholas Gianopulos), Fleisher’s design is the antithesis of that lightweight glass building. Where the saucer appears ready for liftoff, Fleisher’s stone redoubt is rooted heavily on the earth. Instead of a flat modernist roof like the one on the saucer, Fleisher’s pavilion sports an unlikely king’s crown. Neighborhood lore claims the shape is a reference to the folds on the hat worn by Christopher Columbus. Because the neighborhood was largely Italian in 1960, that could be true. Perhaps Fleisher conceived of the tower as a modernist version of the round Martello towers that line the coast near Genoa. But crown-like roofs were all the rage in the early ‘60s. Philadelphia architect John Fridy gave his Howard Johnson’s restaurant in Asbury Park an almost identical topper in 1962. A variation of those accordion folds can be seen in Philadelphia at the Charles Santore Library at Seventh and Carpenter. Designed by Philadelphia's John Fridy, this restaurant on the Asbury Park boardwalk is an example of the 1960s-era vogue for round buildings. Its crown strongly resembles the Columbus Square rec building by Roth & Fleisher. Or maybe Fleisher just wanted the pavilion to look taller. The structure is unusually small for a park building, just 35 feet in diameter and roughly two stories tall. Intended to serve a neighborhood senior center, it contains just one large room, a small mezzanine, and restrooms. Its diminutive size was a big issue when the project was presented to the Art Commission in 1959. Roy Larson — the architect who was then in the middle of designing the LOVE Park saucer — complained that Fleisher’s pavilion was too small to function effectively. But the Department of Recreation held its ground, insisting that the building was sufficient for the neighborhood’s needs. It was wrong, and the pavilion’s size has now contributed to its undoing. After the city built a larger rec center at the north end of the square in the mid-‘80s, Fleisher’s pavilion lost its main purpose. It was turned into a weightlifting gym for a time, but it is no longer in regular use. After neighborhood residents completed a master plan for the park in 2011, a decision was made to demolish the pavilion to make room for an expanded dog park and larger lawn, and to improve views into the park from the corner of 12th and Reed. This map shows the new layout planned for Columbus Square. Rather than launch a defense of this important building, the Department of Parks and Recreation acceded to the advisory council’s wishes and is now seeking a contractor for the building’s demolition and the park’s renovation. It’s not unreasonable for the neighborhood to want a bigger dog park, but, based on the plans, there seems to be room for both the pavilion and the dogs. Some say the the structure is unsound, but that’s disputed. The building’s footprint is so tiny that it’s hard to believe it is in the way. This rendering shows the enlarged dog park and grassy play area. The diagonal path goes through the area where the 1960 building by Elizabeth Fleisher now stands. It’s worth remembering that many people in the city also wanted to demolish the saucer as part of LOVE Park’s renovation. The long view prevailed, and it is now seen as a Philadelphia icon — one that will produce revenue for LOVE Park. Because this is women’s history month, it’s also worth pointing out that, 85 years after Fleisher received her architecture license, it’s still rare to find a Philadelphia building designed by a woman. The Columbus Square pavilion may be small, but that doesn’t mean it can’t find a use — as a cafe, computer lab, yoga studio or storage room. Our recreation buildings are too precious to discard so lightly. This feature on Elizabeth Fleisher appeared in the Inquirer in 1951.